If you would like to see the inside, you may go to my post HERE. If you would like to see more details, have a look at my original post HERE. This was from an online class from Susan Sorrell through the Fiber Arts/Mixed Media site. You can find the tutorial for the thread catcher/pincushion HERE - the rest of the pieces I simply made up as I went along. - There's an interesting article HERE (accompanied by comments) regarding the pros and cons of vintage vs. new sewing machines. - Mary Corbet has written a great post HERE about keeping the back of your embroidery neat. - Those of you who are quilters might be interested in seeing some ways to make your bindings look more interesting found HERE. - Have a look at the amazing miniatures found HERE. Today, a quote from A.W. Tozer..."We cannot pray in love and live in hate and still think we are worshiping God"
During that period I was making quite a number of different felted bags and this is just one of them. The pattern is the "Southwest Style Bag' from a Paton's booklet called 'Fabulous Felting'. A hussif - and you can see more details if you go HERE. And at the end of December I finished making this from remnants from my denim stash..
- You can get free access to a great organizer bag HERE. - Sometimes the simplest things are the best and you can see why HERE. - You can get lost browsing through all the free patterns HERE! - For those of you who end up carrying a ton of loyalty cards, perhaps one of THESE might be just what you need. Another of the anonymous quotes..."Just remember that whatever you put up with, you end up with"
Today we will re-visit 2010 and 2011. In February of 2010, I completed working on Ellyron, my studio companion dragon. She was a test run for a pattern ('Draconis') by Amy of An Li Na Designs. embiggen them to see more details. - I just read THIS very interesting article about artistic paralysis and thought some of you might find it of value. - I don't know if any of you will have a use for THIS but I can see it on a shed door - or inside the house if you like rustic decor. - Came across THIS tutorial and thought some of you might just have the makings lurking in a drawer somewhere. - There's a great tutorial HERE to turn an old glasses case into a sewing case. - In yesterday's post I sent you off to see the pretty little nail polish bag from a tutorial HERE and I just now discovered another post about it HERE which shows some ideas of how else to use it, as well as some adjustments to the original pattern. - I don't often send you off to commercial sites, but I'm making an exception for THIS. Sunbonnet Sue, all grown up! - If you have a little one in your life, and if that little one is fascinated by fairies, you HAVE to make one of THESE!!! Today the quote is from Paulo Coelho..."The world is changed by your example, not by your opinion"
And, just for a change of pace, I even stenciled a wall! re-paint and asked me to recreate the original. I sent out this poor nekkid little doll..
home to me, approx. a year later! If you want to see further details, have a look at my post found HERE. - THIS is a really pretty crocheted vest pattern. - One of THE most talented embroidery artists I know (as well as being an all-around nice person!) is Karen Ruane. She has just announced her newest online class and I can guarantee you will love every minute of it (if past classes I've taken part in are any indication!). You can read more about it HERE. And if you don't know Karen, please have a peek around her blog and be prepared to be awed and inspired!! - If you know someone who is a fan of nail polish, perhaps you'd like to make her one of THESE bags? - I found THIS post to be interesting....so many different variations on an exploding needlework box (also known as etuis). The blog isn't in English, but there is a translate feature...altho' you won't need it. - THIS intrigues me! What embroiderer wouldn't like one of these to hold embroidery supplies?? Or how about making one (or several) of THESE? Today's quote is from Mel Robbins..."Don't tell people your dreams. Show them"
In July I was playing about with rust and came up with a fabric 'box' of sorts. You can read more about it (and see more pictures) if you check out my posts found HERE and HERE. And in May of that year I showed a crazy quilted bear that had been created in a round robin I was involved with..
- There's a very interesting post HERE about working with UFO's. - HERE you can find a great tutorial to make a stroller bag. - THIS would make a really great conversation piece, and even better provide excellent storage. - If you go HERE you will find a really cute needlecase pattern (scroll down to to see it). Today your quote is another anonymous one...."Learn to be alone and to like it. There is nothing more freeing and empowering than learning to like your own company"
Now my latest barn is done, it's time to switch gears and come up with something that will be hopefully useable for the winter issue of the Crazy Quilt Quarterly magazine. Unfortunately, that particular project isn't one I can share on here until after the magazine comes out. So....casting my mind about for something....anything...I can possibly mumble about, I came up with doing a little retrospective of my blogging years (I know...b-o-r-i-n-g to those that have stuck with me all those years) and perhaps re-share some of my favourite things I've created. I apologize in advance for the dismal picture quality of much that you will see - my camera wasn't the best back then. My first post was March 20, 2006 and I must admit even I'm surprised that I've found enough to bother mumbling about for all that time! If you're interested, you can see that very first post HERE. One of the posts I did that year was all about fear (part of a Studio Friday challenge). Upon re-reading what I wrote I realize that nothing much has changed from then until now. There was some fear that we would be drummed out of the guild but fortunately everyone saw the humour in it. 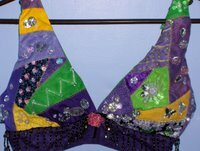 Our bra creations then went on to be auctioned off for a breast cancer fundraiser. This is what I said about it....For those who are wondering it's a pattern from 'Seams Like Glass Designs' by Lise Merchant (who happens to come from Whitehorse, Yukon) called 'Chickadee Dee...Dee...' (obviously). Reverse Applique and machine quilted. Size is approximately 27" square. Did you notice the price tag? All that beautiful pearl cotton for the princely sum of $2.99 minus 30% because it was senior's day! Woo hoo!!!!!!!!!! - HERE is another something further on the Christmas in July theme. Cheap supplies - and ever so cute when done! Says it's for kids - but I think it's adult-able too!!! - THIS one is really nice too! - if you have a wee little girl in your life, I'm pretty sure she would think you were the best mama/grandma in the world if you were to make her one of THESE. - Have a look at the art done on tea bags HERE. Another anonymous quote..."You aren't wealthy until you have something money can't buy"
Over the weekend I finished the latest barn project. This one isn't finished as a wall hanging because my customer would like to frame it. 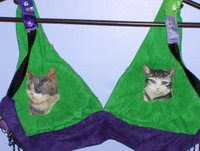 - Pam Kellogg has put out the call for submissions for the Winter/Christmas edition of the 'Crazy Quilt Quarterly' magazine and rather than me re-saying what she already has, here it is....."I'm looking for Winter and Christmas designs, crazy quilt dolls, bears...anything 3 dimensional, ornaments, snowmen, gingerbread men, santas....typical Winter themes." and " If you would like to share photos, articles, tutorials or if you would like to purchase ad space, please drop me an email!" You may contact Pam through her email address pkellogg@mc.net. Crazy quilters are a curious bunch and we'd LOVE to see what you're working on or any tutorials you might want to share. Remember - the magazine is written by YOU so please don't be shy! - Many bloggers are referencing Christmas in July, so in that vein, how about lots of links HERE to making Christmas-themed table runners? There's another pattern HERE that could easily be enlarged to make a wall hanging or larger quilt. - Further on the Christmas in July theme, how about THIS adorable gingerbread house - in crochet! And perhaps some of THESE little snowmen to go along with it? - There's a tutorial HERE to make a shadow quilt block. - THIS is one of those things that makes you simply think 'awwww'. Another anonymous quote today.."Never make someone a priority who only makes you an option"
I think if you click on the picture it will embiggen enough for you to see the barnyard gate I finally created. Took me a lot of navel contemplation to finally decide on what to do. Took some bubble, bubble, toil and trouble in the cauldron in the kitchen to brew up the proper colour of paint to then immerse two different weights of cord into. Once that dried it was stitched into place and then highlighted with more paint to make it (hopefully?) look rusty and aged. There's also been some more paint applied here and there to create more shadows and highlights. Now....to quilt!! I won't be finishing it into a wall hanging this time because my customer wants to get it framed. - THIS is an interesting version of a tote bag - love the coffee cup (or water bottle) pocket. - Here's one for the quilters - if you are contemplating making a quilt for a man, how about THIS one (there's a clickable link there for the PDF pattern)...the red plaid is pretty cool! - And another quilt - THIS one is for the Star Wars fan! - For the crocheters - there's a beautiful afghan pattern HERE. If you scroll down you will find links to the individual blocks. Also go HERE to see it in different colourways. - For those of you with little ones to entertain over the summer holidays, perhaps some of the Lego ideas HERE might be fun for them to do. - There are some really nice printable bookmarks available HERE. A flub or a fix, that is the question. What do you think? You can also see some other changes have happened since I last shared a picture. There has been some stitching, highlighting and shadowing done on the barn (and those pesky boards!) and the base for a tree limb has been added. Now to add some of those fussy cut leaves to finish that area. - THIS is an interesting technique for sewing curved pieces for a quilt. - Go HERE for several ideas for using vintage linens. - Have a look at the sweet wee bird's nest embroidery tutorial HERE! (Thanks to Mary Ann for the head's up about this). - If you follow THIS link and look on the left hand side (scroll down a bit) you can sign on to get access to a very good (and better yet, FREE) online quilt magazine. On the right side you will notice the option to pay a little bit to receive a more in-depth version of the magazine. I've been on their mailing list for the free version for quite some time and I find it interesting every single time and so I'm quite content to continue without upgrading. - THIS is a really cute little bag that would be perfect for stash busting (and for gifts too). - THIS is one of those projects that is quick and easy to create and yet is so pretty too. You could, of course, wrap the hangers in batting first, to make them cushier. - Most of you know I love denim so of course THIS caught my eye! - I stumbled across THIS really interesting blog post and thought I'd share it with you. Some good food for thought there! Today I have a definition for you..."Stashcovery: That moment when you rediscover an item in your stash that you forgot you had"
It was much cooler over the weekend so I was able to get the iron out and 'weave' the boards on the latest barn. I was also able to do some embroidered flora which, upon further contemplation, I need to fix. I don't like the background fabric and it's too late to replace it (unless I seriously want to undo two days of embroidery and then re-do it). So...stay tuned....there's a fix in mind, but it might be a flub, who knows. - There's a tutorial HERE to make a folding fabric grocery bag....handy to keep in your purse (and a scrap buster too!). Gift idea as well!! - If you like Sunbonnet Sue, have a look at the free pattern available HERE! - If you have a little one in your life that loves unicorns, there is a sweet crocheted pattern HERE. - THIS is a really sweet hat for a little one. - If you happen to be fascinated by fairy gardens, perhaps some of the ideas HERE might interest you - even just seeing some of them is pretty cool! Today there's another anonymous quote: "Mess? What mess? That's creativity scattered around the room!" - Have a look at THIS amazing project Lauren did! I love it. 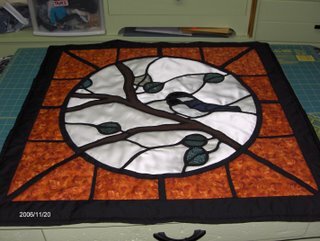 - Sue has created an amazing quilt which is accompanied by the story behind its creation. Well worth reading/seeing HERE. - There's a link HERE that leads to a free PDF pattern for an amazing butterfly afghan. - You might find THIS post interesting. The thing that caught my eye is the handmade needle organizer (near the bottom)...it would be perfect for storing needles that are used and haven't reached their expiry date. While you're there, check out all the other sewing room organization tips in her sidebar! Today your quote is from Winnie The Pooh & Piglet..."Piglet: "How to you spell love?" Pooh: "You don't spell it, you feel it"
There's not much happening on the creative side of things here at Chez Magpie. It's hot. Hot. Hot. My little sewing room doesn't have air conditioning so I have to rely on a ceiling fan and a portable fan which is okay most of the time but when it gets this hot even they don't stand a chance. Fortunately we have a portable a/c unit in the living room so there's one room that's relatively cool. So.....instead of progress on my latest barn, I'll show you what part I'll be working on next. This will require a ton of ironing (and there's no way I'm standing over a hot iron in a hot room at the moment). - THIS is one of those things that you really want to study to discover all the amazing details that went into it. So pretty!! - Have a peek at the absolutely amazing embroidery done by THIS artist! - And the work of THIS artist too! - I may have sent you to THIS link before (sorry if I can't always remember because I've done so many!!) but it's one of those handy little cheapie tools that can make your life SO much easier! - THIS is definitely a beautiful crochet project - and would hold your interest throughout I think. And have a look HERE to see some amazing colourways for the project. - THIS would be fun to make for a young person in your life - lots of play value! - I need a summer housecoat. Mine is a heavy velour and it's h-o-t and I NEED a cooler version. Stumbled across THIS and now I'm on the search for a pretty sheet so I can make one too! I think, even with my limited clothing sewing abilities, that I could manage it. Today your quote is from Winston Churchill..."Courage is what it takes to stand up and speak. Courage is also what it takes to sit down and listen"
There's been a tiny bit of progress on the latest barn...there would have been more if it wasn't so hot here right now. My sewing room is like an oven so it's hard to spend much time in here. It's currently 27C with 73% humidity level outside and it's only 8:30 in the morning. Going to be another scorcher it appears! - Have a look at the wonderful work done by THIS artist! And you can see more HERE. - If you have a little girl in your life, perhaps she'd like one of THESE! - There's a tutorial HERE for a really cute pair of pants for little one. - Have a look HERE for a lovely pattern to use one of those 'cake' balls of yarn (scroll down for the pattern). - It's summer on this side of the world and many of us like to carry a bottle of water with us - perhaps one of THESE carriers might be useful? Good stash buster too!! - HERE is another artist that does amazing work! - I have the commercial pattern for making THIS - and, like the blogger here, I disliked the use of bias tape. This version is better I think (and another stash buster that would make great gifts!). - Sometimes I stumble across something that has the definite 'wow' factor and the work of THIS artist certainly has it! And HERE are some of her fantasy creatures!!! - You might have fun scrolling through all the helpful charts found HERE. They cover all sorts of subjects! Another anonymous quote..."You'll have good days, bad days, overwhelming days, too tired days, I'm awesome days, I can't go on days...and every day you'll still show up"